Meal Planning - My main reason for meal planning is to try and save money on our weekly food shop. Our spending when it comes to food is dreadful, it's an area that we could easily improve. I started to do this more and more towards the end of this year and I definitely end up spending less when I do this. Plus, I'm trying to shop more at Aldi and markets too. Water Intake - I'm getting better at remembering to drink more, but sometimes I do have too many sugary drinks! I'm going to try and drink more water because I want to make sure on not adding unnecessary additives and sugars into my diet. Driving License - One of my Christmas presents this year was money towards driving lessons. I'm now 27 with two children, a license is now a necessity. I could get away with not having one previously, but that now really needs to change. This is one I really want to complete by the end of 2016, but it's one I'm most nervous about too. Healthier Lifestyle - Ok, so this isn't necessarily about losing weight, but I'm hoping that I will. I desperately feel like my lifestyle needs to change. Healthier food choices and upping my fitness are going to be the main areas that I work on. I want to feel healthier, I would love to be able to complete a 10k and it would be an added bonus if I could fit back into my size 12 jeans! I don't think my goals are impossible or out of reach, me and my hubby seem to be on the same wavelength about a healthier lifestyle so I'm hoping we can motivate each other in order for us to complete our goals. He is a good runner, so perhaps he can give me some good tips and help me reach my dream of completing a 10k by the end of 2016. 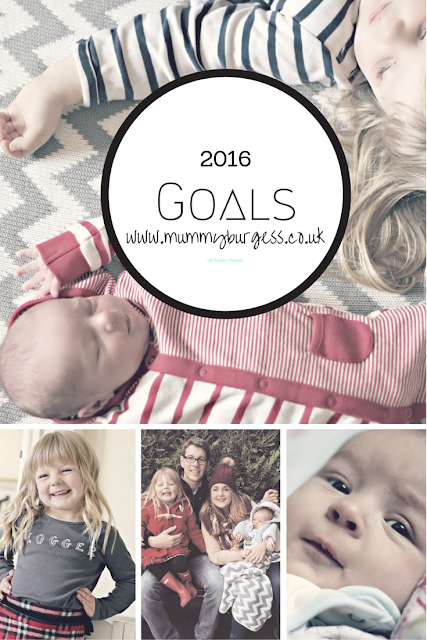 Do you have any goals/resolutions for 2016?